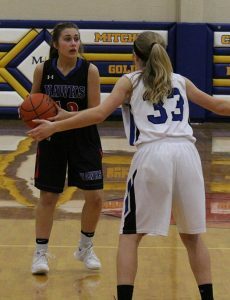 Katie Schmit looks for the open girl during the varsity game for the Lady Blackhawks in Mitchell on Thursday, Feb. 14. On Monday, Feb. 11, the SCW Lady Blackhawks traveled to Huron to take on the James Valley Christian (JVC) Vikings. Both the junior varsity and the varsity teams came home with wins. The final score of the varsity game was 59-29 and the junior varsity game ended with a score of 39-26. On Thursday, Feb. 14, the Lady Blackhawks were on the road again. This time they were in Mitchell for a doubleheader against the Mitchell Christian Golden Eagles. The Lady Blackhawks finished their regular season with a record of 14-6. Their next court action was on Tuesday, Feb. 19 vs. the Colman-Egan Hawks in the second round of the Region 4B Tournament; they had a bye the first round. The Region 4B championship round will be in Huron on Thursday, Feb. 21. Results of the region tournament will be in next week’s issue of the Journal. …Read details about the game and see an additional picture in this week’s issue of the Sanborn Weekly Journal. The Town ‘N Kountry Kids Red Crew 4-H Club met on Feb. 15 at the Community Center in Woonsocket. The meeting was called to order by President Xavier Baysinger. The Flag Pledge was led by Alex Anderson, and the 4-H Pledge was led by Henry Hunter. Roll call was led by Vice President Bailey Feistner with the topic, “What is Your Favorite Candy?” which was answered by 25 members. The secretary’s report was read by Tati Roberts and approved as presented. The treasurer’s report was presented by Megan Linke. It was moved by Lane Burkel, seconded by Sutton Senska, to approve the report. Motion carried. Devyn and Dilyn Brooks reported on Shooting Sports. Bailey gave an update on her activities as 4-H Ambassador. Hope Baysinger and Avery Miller told us about the YQCA training. Bailey also shared some of her experiences at the Stock Show where she participated with a Horse Quiz Bowl team. For old business, the club discussed working on a date for a sledding fun day at Wessington Springs. There is also now an ice skate park there. The members talked about a visit to the nursing home in Wessington Springs and maybe doing a line dancing activity. For new business, the club talked about the Statewide Community Service Project. It was moved by Lane Burkel, seconded by Dilyn Brooks, to participate in the Soles4Souls project, which has a goal of collecting 10,000 pairs of new or gently used shoes to be sent to countries in need. Motion carried. Those appointed to the committee to organize and promote this are Tati Roberts, Lane Burkel and Avery Miller. Fruit sales are in process, and each family has a goal of selling at least five items. 4-H Leader Paula Linke will get an article in the paper about fruit sales. Proceeds go towards a 4-H Building addition. The club members discussed the planning for a building addition which would provide more space for multiple activities including Shooting Sports and Achievement Days. The club talked about our setting barrels fundraiser for Memorial Day weekend and whether we want to continue with this, even if just for part of the three days. Paula will follow up with individual families. Members were reminded about the Project Incentive Program. They need to get a 4-H project completed, take a picture and send it to their 4-H leader or to Sherryl Rankin at the 4-H office by April 29 to get entered in a drawing for movie tickets. The club talked about some dates for our next meeting. Paula will send a note out with the options. Snacks were served by Bailey Feistner. Following the meeting, Character Officer Megan Linke presented an illustrated story on character called “Nails in the Fence.” Paula showed some project ideas with pictures captured at past State Fairs. Members signed cards to send to our elderly friends. A Poultry Breeds activity was completed. Ty Burkel presented an illustrated talk on “I Like 4-H.” Lane Burkel gave an illustrated talk on Shooting Sports called “Don’t Chase Rabbits.” Tati Roberts did an illustrated talk on sign language, and also led a group activity on what she presented.